"Mouth watering, bowl scraping good! This recipe also makes a great dinner entree!" Preheat oven to 375 degrees F (190 degrees C). Lightly grease a 9x13 inch square baking dish. In the prepared baking dish, stir together the shredded potatoes and butter. Line the bottom and sides of the baking dish with the mixture. In a bowl, mix the sausage, Cheddar cheese, onion, cottage cheese, and eggs. Pour over the potato mixture. Bake 1 hour in the preheated oven, or until a toothpick inserted into center of the casserole comes out clean. Let cool for 5 minutes before serving. 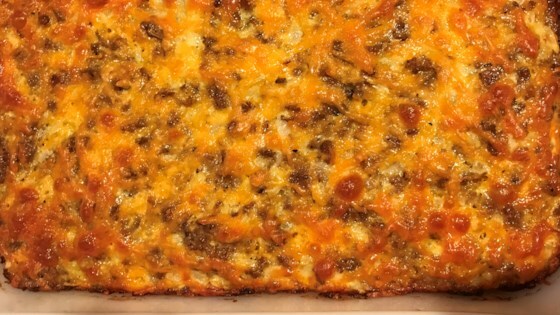 See how to make a top-rated breakfast casserole.